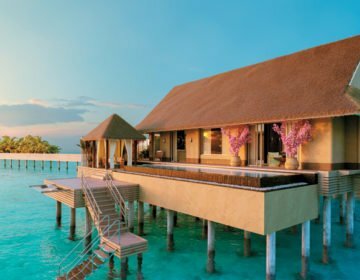 For many, it’s a dream to vacation in one of the stilted overwater villas in the Maldives, but did you know that you can now stay in an underwater residence the Conrad Maldives Rangali Island Resort? This recently renovated mega-resort is described as an extraordinary playground, and it certainly stands out from the crowd with it’s private pools, wine and cheese tasting room, and underwater restaurant. Read on for a sneak peek inside the uber-luxurious underwater suite, and all the juicy details about the Conrad Maldives Resort. The Muraka is the name of resort’s crown jewel: A two-level underwater villa. Muraka actually translates as the word coral from the traditional language of Dhivehi, and it’s certainly an apt name for this underwater paradise. The Muruka is divided into two floors: The top level is located above the waves, while on the bottom floor you will find the underwater master suite. On the first floor you will find beautifully-appointed ocean-themed bedrooms with aircon and a flat screen TV. Outside is an open decking area with sun loungers, parasols and lanterns, so that you can transform your daytime chill spot into a romantic oasis to dine under the stars. The bathroom is enormous, and it has a stand-alone tub complete with floor-to-ceiling glass windows, so you can watch the sunset while soaking in a candlelit bubble bath. 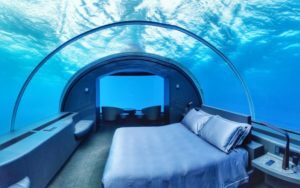 Head on down to the lower level and you’ll find the real star of the show, the master suite bedroom which is submerged under the water and sits on the ocean floor. It features a curved glass ceiling, which allows you to marvel at the tropical marine life as they flurry overhead. Expect to see everything from turtles and manta rays to (friendly) sharks during your stay. There is a, enormous bathroom downstairs too, which also has glass walls, jack and jill’ sinks and a rain shower. It’s truly a unique experience that is completely out of this world: no pictures come do this suite justice, it really has to be seen to be believed. You would hope so though with the price tag – a stay here can cost $50,000 a night! There are 10 other accommodation types available to choose from at the Conrad Maldives Resort. If you want to stay on dry land, then you will adore a stay the Beach villa or the Deluxe Beach villa. The Deluxe Beach villa comes with its own private manicured garden, a plunge pool to cool-off from the Maldivian sun, floor-to-ceiling windows, and an outdoor bathtub. The accommodation is incredibly spacious compared to other Maldives resort villas, and it is spread over 3230 square feet. 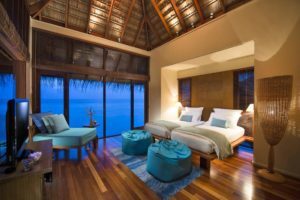 If your budget doesn’t stretch to the Muraka Villa but you still want to stay over the ocean, then we can recommend one of the many overwater villas. Take the overwater suite which is situated a hundred meters away from the main island, so you’ll have complete privacy with a stay here. This villa is designed with spa-lovers in mind: It comes with a private double spa treatment room, as well as a whirlpool, and large sundeck with steps directly down into the ocean. If you’re traveling with the kids in tow, then go for the Conrad Maldives Family Water Villa which has two bedrooms, and is perfect for a family stay. Perhaps you have your heart set on staying in an overwater villa with private pool, if so, there is no better choice than the sunset water villa. This magical villa won the title of ‘leading luxury hotel villa of 2017’, and it’s easy to see why. It’s set in its own private lagoon which can be reached by jetty or by jet boat. The master bedroom features a rotating circular bed, and the softest comforters for a dreamy night’s sleep over the ocean. In the living room you’ll find glass floors so you can watch the underwater world from the comfort of your home-away-from-home. Head outside onto your spacious sundeck and you will find a private infinity pool, sumptuous sun loungers and linen-lined daybeds. The overwater villa also comes with a personal island host, who is on hand for all your island needs – any time of day or night. Every villa and suite at the Conrad Maldives comes with all the amenities you’d expect from such a five-star establishment, including coffee making machines, free WiFi, a mini bar, complimentary water, adjustable aircon, and flat screen TVs with DVD players and HDTV. 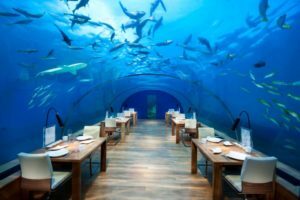 If you thought the accommodation options were impressive, wait until you see some of the dining spaces at the Conrad Maldives Resort. The Conrad Maldives may be home to the world’s first underwater villa, but it also has its own Under-the-Sea Restaurant. The Ithaa restaurant has panoramic views of the house reef complete with colorful corals and vibrant marine life. Here you can dine on delights such as sous vide wagyu beef tenderloin, served with prawn ragout, squid ink and celery root pureé charcoaled shallots, and follow it up with a chocolate kaffir panna cotta pudding. The award-winning chefs are also able to cook up dishes to accommodate for vegetarian and vegan guests too. 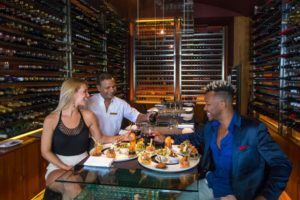 And from underwater restaurant to an open-air dining hotspots, the Sunset Grill provides a beautiful place to dine on fresh seafood and enjoy eclectic mix of old world wines. This is a more casual affair, and it’s the perfect place to enjoy a light lunch, such as the oven-baked roma tomato with buffalo mozzarella, avocado, aubergine crisps and balsamic syrup. We love the addition of the speciality mustard menu, where you can choose from a selection of more unusual condiments including blackcurrant and wild herb mustards. If you’re seeking a little daytime fun, then head on over to the Conrad Maldives ‘Quiet Zone’, an adults-only bar that is set out over the azure water waters that encompass the Private Island. Despite its name, the spa plays some Ibiza-worthy chillout tunes, and has quite an electric atmosphere in the afternoon. It has one of the best cocktail menus out of any resort in the Maldives, and that’s quite a big achievement. They have a nostalgic and unusual cocktail menu, which includes ingredients from the resort’s hydroponic garden. There is also an all-day food menu, so you don’t have to head back to the main island to refuel. The Quiet Zone restaurant offers up quick bites like prawn tempura, pizza, sandwiches and wraps, as well as a selection of desserts including a tropical cheesecake and a decadent black forest cake. The Conrad Maldives also has the only purposely designed wine and cheese bar in the Maldives. This bar has a lovely, unpretentious setting and is located over imported black-volcanic sand. There are over a hundred different types of cheeses available to choose from here, each carefully selected by the maitre d’fromage. The kitchen is able to rustle up gooey fondues, traditional tapas or generous platters for you to enjoy, and a resident sommelier is able to select the perfect pairings for your cheese feast. These are just a selection of the restaurants and bars available on the tropical island. Guests can also head to Coco Grill, Mandhoo Restaurant, Rangali Bar, the Wine Cellar and the award-winning UFAA By Jereme Leung. Room service is available here, plus a range of private dining experiences to surprise a loved one. You will never get island fever here, as the Conrad Maldives have gone all out with their facilities, amenities and spa offerings. Winner of the Best Private Island Spa & Hotel Spa, Haute Grandeur Awards 2017” title, the Spa is the place to bliss out and wind down after a long flight. Each spa ritual come with a calming foot bath ceremony, which includes exotic flowers, salts, and healing essentials oils. You will also be guided through a short breathing session to prepare you for the ultimate spa journey. The overwater spa rooms have glass floors, and uber-comfy massage beds. We’ve never seen quite an extensive massage menu at a Maldives resort: Here you can choose from shiatsu, hot stone, thai, ayurvedic, lomi lomi, aromatherapy and four-handed massages. If you’re not sure what one to pick, then the wonderful spa therapists are available to recommend the best type of massage for you needs. 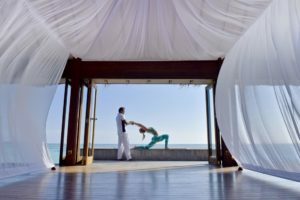 The Conrad Maldives has a focus on all things yoga. They offer daily hatha yoga classes for self-awareness, as well as hour-long meditation and stretching sessions. You can also have 60-minutes of private yoga instruction in a one-on one or couples yoga class. The Conrad Maldives is also the only resort to have their own dedicated naturopath on the island, who is there for all your health and fitness needs. If you love the underwater world, then there are plenty of ways to get your ocean fix. 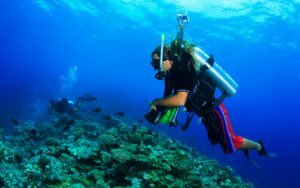 The ocean dive center offers adventure diver certifications, day and night dives, bubblemaker diving classes for kids, plus it provides photo and video services to capture your underwater escapades. You can also go snorkeling at the nearby house reef. The watersport center is filled to the brim with non-motorized and motorized sports equipment. Here you can rent jet skis, stand up paddle boards, wind surfs and even jet packs and jet blades. They also offer catamaran sailing tours, glass-floored boat trips, and wake-boarding lessons. To top it all off, the Conrad Maldives have designed a range of inspired experiences to keep guests of all ages entertained. How does a turtle sarafi sound? Or a sunset fishing trip or dolphin watching cruise? We particularly love the whale shark tour, where you may get to glimpse these enormous gentle giants. 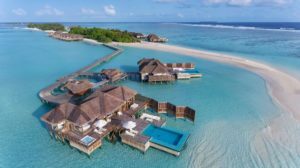 Overall, the Conrad Maldives sits up there with other much-loved Maldives resorts such as the One and Only Reethi Rah and Kuredu Islands Resort. It’s family-friendly, plus it has plenty of adults-only zones to make it a perfect playground for adults too. 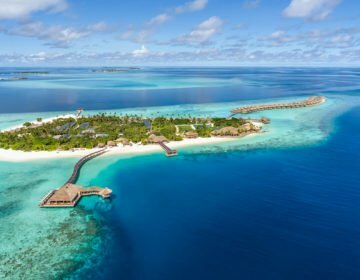 It’s hard to fault this paradise island, but if you’re a little more into that super chilled, Robinson Crusoe vibe, then we can recommend a smaller Maldives resort such as Milaidhoo Island. This smaller resort also has a generous all-inclusive gourmet package which includes all meals, snacks and drinks during your stay, as well as a few extra goodies. Saying that, if the budget allows, you really can’t go wrong with a stay at the Conrad Maldives Rangali Island. Click here to see the latest deals and more photos of the Conrad Maldives Resort. Do you need some extra help booking your dream Maldives resort? 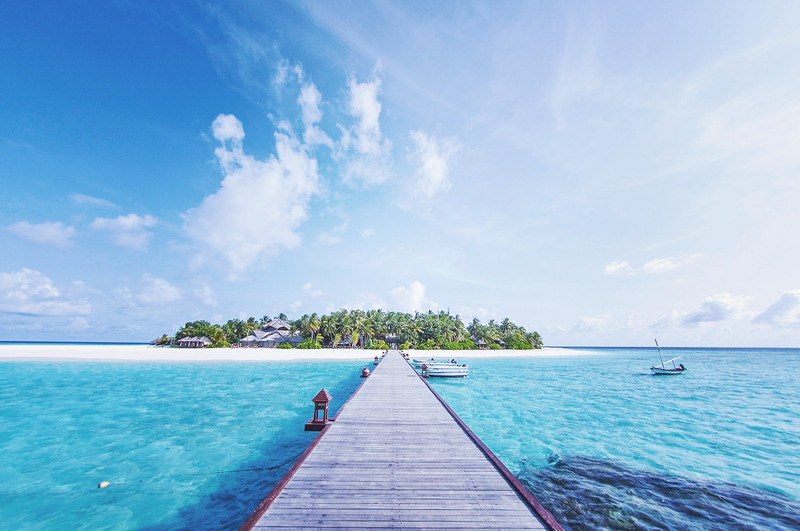 Check out our top picks for the best resorts in Maldives, as well our our ultimate packing guide so you don’t forget those essentials. Happy travels.